Bring vibrancy and beauty into the garden with flowering plants. Grown in a wide variety, each with its own distinct shape, size and color, flowering plants jazz up outdoor spaces like patios, entrances and walkways. When planted in every season, they provide constant color to the garden. Grow favorite outdoor flowers to put your own personal touch on the design. Bring in native, drought-tolerant flowers to help create a low-maintenance, unfussy garden. Hollyhock (Alcea rosea) is a perennial flower with a tall, upright growth habit and moderate growth rate. Growing 24 to 60 inches tall, hollyhock flowers grow on a single spike. Flower colors on hollyhocks are vast to include, peach, white, yellow, red, pink and purple. 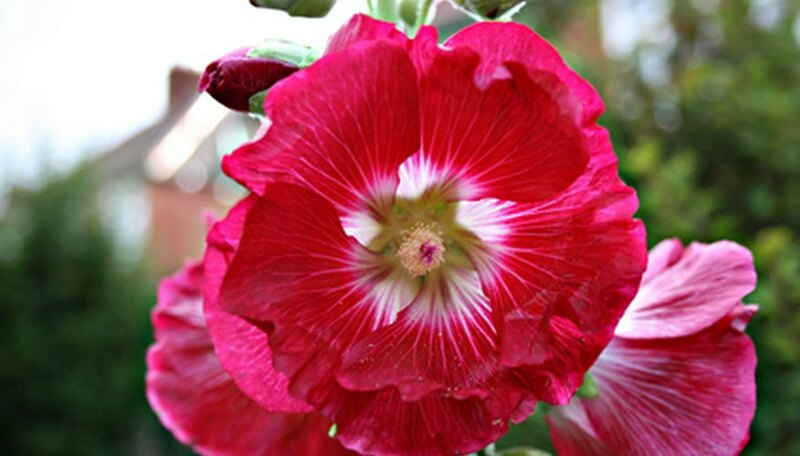 Blooming in spring, hollyhock flowers last into fall for a long-lasting flower variety. Planted along the back of a perennial bed, hollyhocks provide a bright backdrop to the garden. Hollyhocks require full sun and well-drained soil that is average to dry in moisture. The USDA Hardiness Zones for planting are 5 to 9. Moonshine yarrow (Achillea Moonshine), a yarrow flower variety, is a perennial flower with a rapid growth rate and clumping form. Growing 1 to 3 feet tall and wide, moonshine yarrow is a striking summer-blooming flower to grow in the garden. Planted within a cottage garden or garden pathway, moonshine yarrow is known for attracting butterflies to its showy foliage. The 18 inch tall, flat-topped yellow flowers of moonshine yarrow sit atop the gray leaves that contrast nicely with the bright blooms. Versatile, moonshine yarrow withstands heat and humidity, ideal in arid climates where moisture is limited. Moonshine yarrow requires full sun only and well-drained, moist soils to thrive. Divide moonshine yarrow in spring to grow in other areas of the garden for bright bursts of color. The Hardiness Zones for planting are 3 to 8. Tickseed (Coreopsis rosea) is a perennial flower with a rapid growth rate and bright lavender to pink blooms. Growing 1 to 3 feet tall and wide, tickseed is an ideal flower to plant as a ground cover or in a cutting garden. The daisy-like blooms of tickseed have yellow centers. Blooming from mid summer to early fall, tickseed is a long-lasting flowering plant. The textured, dark green foliage of tickseed is fine to give it a light and airy appearance. A butterfly and bumblebee attractant, tickseed can be divided in spring to plant in other areas of the garden. Tickseed requires full sun only and well-drained, fertile soil. The Hardiness Zones for planting are 4 to 8.